How's your wrappin' going? I haven't even begun to wrap gifts for this year. Luckily I dug up some wrap photos from last year that I never had the chance to share with you. Last year I was clued into a stash of vintage cellophane ribbon being sold at a local art store. According to the penciled note on the spool the ribbon dates to 1938. Perhaps that's why it's printed with the San Francisco Bay Bridge and skyline which would have still been a young landmark. Of course I bought it in a few colors. I meet lots of people who are a bit intimidated by gift wrapping especially this time of year. Well I was intimidated by this ribbon! Aged brittle cellophane is not easy to work with! If you're nervous about your xmas wrappings make sure to use supplies you're comfortable with. And remember that it's about the sentiment of giving and not how perfecting crisp your wrapping is. Any extra creative embellishment will add that thoughtfulness. Have fun and happy wrapping! It's hard to tell in the photos but I used wire to float one of the snow flakes above the package. Wrapping paper is from a 2013 print promotion by Hemlock Printers. Posted in Gift Wrap and tagged with gift wrap, gift giving, xmas, Christmas. December 18, 2014 by Shasta Garcia. Yup, I'm back to blogging! While on my blog break I had the pleasure of being on a panel discussion for AIGA SF's D.Talks series along with Everett Katigbak and Damon Styer. Josh Levine was our fearless moderator who integrated the audience into the conversation. The theme of the night was the trend of handmade in design. Since the event I've been thinking a lot about our discussion and thought it worth a share here. The question of the night quickly evolved into answering; Why handmade? My personal theory is that with screens and perfectly uniform type being ever present in our every day we're left with a longing for imperfection and for something personal. 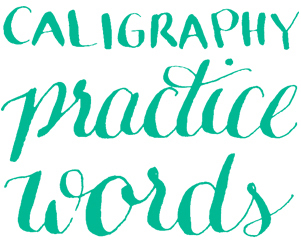 I once wrote about the calligraphy trend after I'd taken my first classes. At the time I wondered; Is it a trend? Now over a year since writing that post it still gets weekly hits and shows up first (at least for me) in search. This tells me at the very least the googleverse thinks it's a trend. Maybe trend is the wrong word for it. It has again become popular and valued. Sign painting is a good example of hand crafted coming in and out of fashion. Damon owns New Bohemia Signs. For the unfamiliar, New Bohemia Signs practices the art of hand lettering with quill brush and paint. When Damon bought the shop it was because its original owners were ready to shut it down. The ability to cut perfect vinyl letters for signs had fragmented the sign industry winnowing the artists down to very few. Hand lettering hasn't suddenly won over the goliath of vinyl lettering but the craft is once again being elevated. Now New Bohemia finds itself painting the signs for the interiors of many tech startups and holds monthly classes to share the art with interested students. Everett shared how handmade directly impacted those creating some of our social infrastructure. Before joining Pinterest Everett helped to found The Analog Research Lab at Facebook. One of the missions they took on was to pose open ended questions. They found the quickest way to communicate with impact was to use wood type to letterpress print posters and wheat paste them around the FB campus. They created an instant dialog as people started handwriting responses on the posters. The thread that started to expose itself in the discussion is that when beginning a creative process computer software sometimes adds an unnecessary layer between inspiration and execution. For prototyping sometimes the quickest tool is pen, paper, scissors or any number of mediums. That thought brings to mind that software companies are recognizing the desire for physical connection to creation. One of Adobe's latest offerings is software and accompanying hardware that allows you to draw with your iPad. It's called Ink and Slide (ruler). It would be easy to think tech is tech and handmade is handmade but this thought exercise indicates they are very intertwined. As you know I make a lot of stuff by hand but the computer definitely is a tool that shows up either to help me complete my vision or simply for sharing here on the blog. Pinterest which is full of imagery of crochet pet costumes and oasis like backyard projects is a piece of tech which is influencing handmade AND it's exposure. It provides inspiration for someone to take on a new project or new skill. It provides a platform for sharing creations and interestingly creates a feedback loop. It shines a light on imagery in the zeitgeist. With fall about to arrive the pineapple trend is about out the door. I joked about it on the panel but for a moment I had a pineapple filled Pinterest feed. One last item about handmade I'd like to mention is that it can provide a quick feeling of accomplishment. As a graphic designer I spend most of my day in front of a computer and most of my projects have many steps before completion. Making something by hand creates balance in my life. But what about this gift wrap? This is a gift for close friends getting married so of course I needed wrap with a really personal touch. I wasn't finding any inspiration in my wrap stash so I made some wrap just for them. Their invitations incorporated a purple and orange gradient. The easiest thing to do was to use a big foam brush to wash gouache over a sheet of paper I had previously decorated. No computer necessary. The purple gods eye has been waiting to top a package and was perfect for my purple loving friend. In the span of a half hour I had my idea and had executed it. I'd love to hear your thoughts on this topic of handcraft if design. Lets keep the conversation going in the comments! Posted in Gift Wrap and tagged with watercolor, gift wrap, gods eye, gradient, purple, orange. September 17, 2014 by Shasta Garcia.